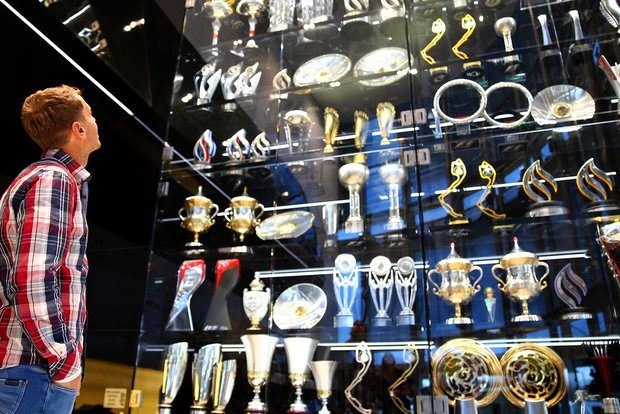 Overzealous Thieves have raided the Red Bull Racing factory in Milton Keynes early Saturday morning by driving a car thru the front entrance in order to steal over sixty racing trophies! Which has confounded team principal Christian Horner, especially due to the revelation that many are simply replicas. Thus, the robbery of cherished racing trophies from Red Bull marks the second such heist of memorabilia in Jolly 'Ol England, following on this summer's Narly Smash 'N Grab of many irreplaceable trophies from Birmingham's National Motorcycle Museum. Museum Director James Hewing revealed that the trophies stolen are nickel and thus the entirety of the loot would be worth approximately $500 in meltdown, as perhaps the thieves thought they were silver? (With another set of desperate Bastardos unwittingly targeting the Red Bull collection likewise?) With the National Motorcycle Museum posting a $20,000 reward in hopes of their safe return, for which seems to have gone unclaimed. As once again, the general public and more specifically, the phalanx 'O adoring motorsports fans are the ones who suffer from such illicit vandalism!